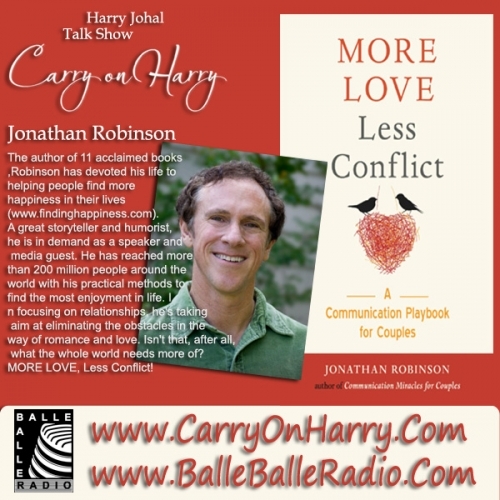 Studio Carry On Harry guest Jonathan Robinson, a renowned psychotherapist and bestselling author, states that everyone really wants care, understanding, and empathy in their relationship. However four relationship mistakes often get in the way of receiving what we want. He calls these four culprits The Four Horseman of the Relationship Apocalypse. They are: Denigration, Denial, Dismissal and Distraction. If there is strain in your relationship, chances are at least one of these is at work in unraveling the fabric of your love. Robinson--who appeared on Oprah and the national morning shows several times-- counsels couples and conducts workshops on communication, leadership and teambuilding with Fortune 500 companies. He is also the author of the bestselling Communication Miracles for Couples. In this new MORE LOVE, Less Conflict Playbook book, he offers more than 30 simple-easy-to-implement, highly practical communications strategies to dissipate the tension, create more connection and ramp up the love. And even suggests ways to get a resistant partner to participate. Robinson recounts challenges and success of his clients that will resonate for readers, and he doesn't hesitate to point out or humorously poke fun at his own relationship mistakes with his wife that have become the instigation for some of his most effective strategies.